A big thank you to Hakam Singh Dhindsa and the students and community of Sikh Academy who donated 1476 lb of fresh blueberries this season. What a gift to receive the best of the local harvest for our clients! Chairman Hakam Singh Dhindsa and Principal Baldeep Singh Hehar of Sikh Academy being appreciated for their fantastic donation. 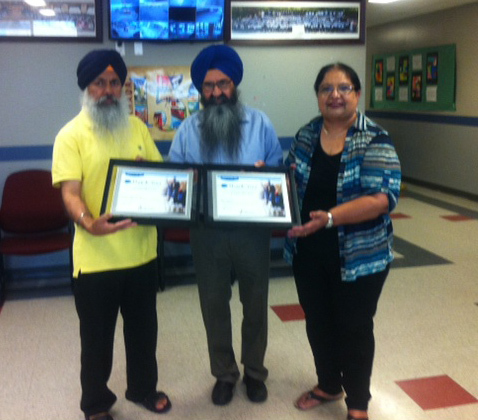 All 1487lbs of fresh blue berries were hand picked by students and associates of Sikh Academy. Our Sincere gratitude to all. The Surrey Food Bank supports 250 families a day. And we are so glad to be able to give fresh produce to all our clients. Farmers and large food producers wishing to donate fresh produce are encouraged to call our Logistics Manager at 604-581-5443, loc.105 to either arrange for pickup or your delivery of a donation to our depot. Thank you for helping us offer hampers that are nutritious and delicious.